Why fight policing? Experiences of criminalization & imprisonment are some of the most durable obstacles to full, equitable participation in our society and major blocks against healthy, stable communities. 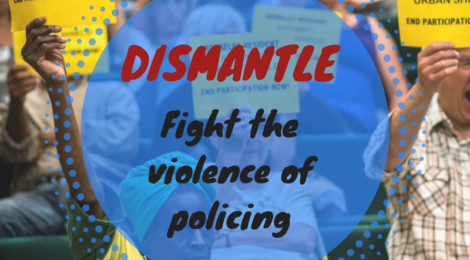 The racialized and classist violence of policing, as well as prison and jail expansion destabilize, fracture, & erode the well being of our communities by removing, isolating, alienating, & criminalizing segments of our communities and rendering them disposable. Critical Resistance is committed to supporting imprisoned people, communities where prisons & jails are sited, & targets of the police violence to resist these attacks. To do this, it is essential to shift the common sense that safety necessitates policing & punishment, & to increase life-affirming resources and practices that uplift our communities. 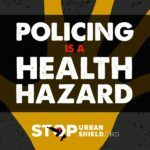 Here are the campaigns and projects that Critical Resistance chapters and members are advancing to fight the violence of policing! Want more info on abolition of policing generally? See here. 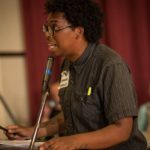 CR Portland (CR PDX) is building the Mental Health Care Not Policing coalition and together they have led two successful mobilizations to City Budget Hearings, driving a wedge between healthcare and policing priorities. 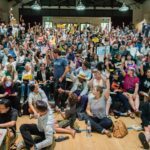 A community audience of over 200 Portland residents burst into full applause when coalition speakers presented our demands to divest funding from policing and invest in mental health care resources not tied to the cops. The chapter also continues to build locally, co-sponsoring anti-prison events andbuilding across prison walls with a strong prisoner mail program. Critical Resistance-Oakland is proud to be a member of the Stop Urban Shield coalition, which is fighting to defund and eliminate Urban Shield, the annual military weapons expo and SWAT training that draws law enforcement from all over the country and world to train police and emergency services in militarized tactics and disaster response. 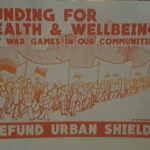 Our membership and staff support Stop Urban Shield campaign strategy, outreach, research and media efforts to amplify the harms of the weapons expo and the urgency and practicality of investing in non-militarized emergency preparedness. 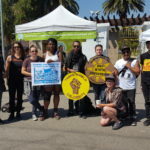 CR-Oakland at Stop Urban Shield mobilization 2016. This work can be understood as a concrete example of abolitionist efforts in the DIVEST// INVEST framework: we must divest from emergency preparedness and policing systems that criminalize our communities and put them at risk of physical harm, psychological trauma, imprisonment and even death, while we invest in emergency preparedness trainings, plans and resources that are life- affirming, people-first, non-militarized and not coordinated by law enforcement. 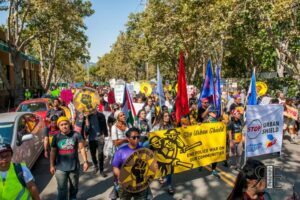 On May Day in Oakland, CR participated in a direct action and rally to put the Alameda County supervisors on blast for hosting the program, drawing over 50 media hits. 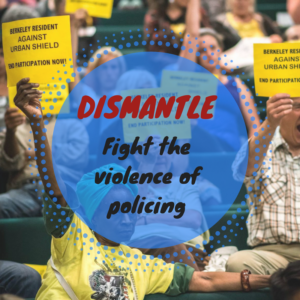 We’ve been pushing hard and making gains to get Berkeley, San Francisco, and other cities to withdraw participation from Urban Shield. 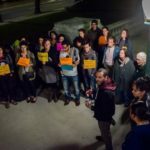 See this video about the recent mobilization in Berkeley, which resulted in police repression against Stop Urban Shield community members. 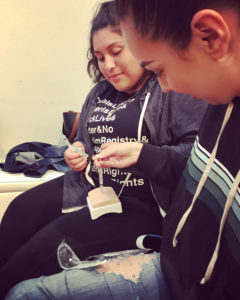 Oakland high school students practice overdose response in a Know Your Options workshop, May 2017. 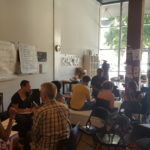 The Oakland Power Projects (OPP) builds the capacity for Oakland residents to reject police and policing as the default response to harm and to highlight or create alternatives that actually work by identifying current harms, amplifying existing resources, and developing new practices that do not rely on policing solutions. ultimately decouple access to health care from policing. The “Know Your Options” workshop series are offered monthly in public and private group settings. They are open to community members and no prior healthcare experience is needed! 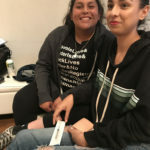 Our goal in workshops is to build people’s knowledge of how policing is a health issue, increase your baseline knowledge of different health topics (accidents and acute emergencies, opiate overdose, behavioral health) , and then practice skills to decrease the harm of law enforcement when health-related events inevitably occur. 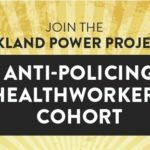 Since 2015, the Oakland Power Projects Anti-Policing Healthworkers have trained up hundreds of Oaklanders in health care and immediate response skills to minimize contact with law enforcement. 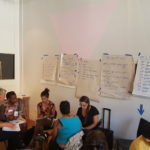 Empowered by the incredible response to the workshops and requests for more presentations, we just trained up a new cohort of 27 healthworkers who are preparing to offer Know Your Options workshops this fall! We are thrilled to be doubling our size and bringing in new energy and skilled people into this project. Request a workshop here. Learn more about the Oakland Power Projects here. 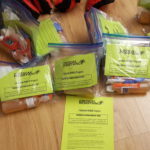 The Oakland Power Projects offered dozens of Know Your Options workshops in 2016, and rolled out these first aid kits. 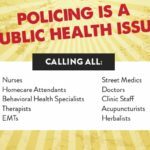 In 2016, a group of public health students, researchers, and organizers felt that it was past time for the public health field to take a stand on the issue of policing and its harms. 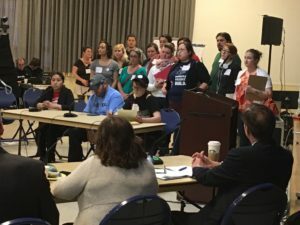 They recognized the daily violence of policing against Black people, other people of color, people with disabilities, LGBTQ people, people experiencing homelessness, and other marginalized communities as a devastating and pervasive public health issue, and that there needed to be a more urgent effort to advance people-oriented solutions. The tireless grassroots protests in recent years against the violence of policing meant that such a statement could not be ignored. The statement was approved as policy for a one-year term. This is a unique victory that we are calling on you to help amplify! TAKE ACTION: Organizations and individuals, please join us and endorse the statement! Fill out this form. Read more here.